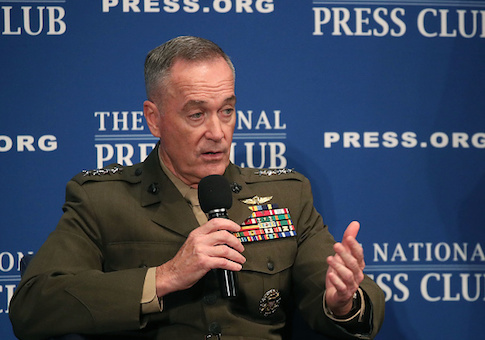 The United States and Russia have maintained an open communication channel after the American military's downing of a Syrian warplane over the weekend, according to Gen. Joseph Dunford Jr., chairman of the Joint Chiefs of Staff. Dunford said Washington will work militarily and diplomatically in the coming hours to "re-establish de-confliction" with Moscow. The Russian Defense Ministry said earlier it would suspend cooperation with the United States and treat all "flying objects" operated by coalition forces west of the Euphrates River as "targets." "We have an effective link between our operations center in Qatar and the Russian Federation on the ground in Syria. That link is still ongoing here this morning,"Dunford said at a luncheon at the National Press Club in D.C. on Monday. "An incident occurred, we have to work through the incident, we have a channel to be able to do that and I think it's going to require some diplomatic and military engagement in the next few hours to restore the de-confliction that we've had in place." Dunford said he had not yet spoken to his Russian counterpart and was awaiting the results of the U.S. military's investigation into the incident before he did so. The United States and Russia established the deconfliction line in Syria in 2015 to avoid accidental clashes between the two forces. Russian military officials threatened to cutoff its hotline with the United States in response to an American Navy F-18 fighter jet shooting down a Syrian warplane on Sunday after the government jet dropped bombs near local forces backed by Washington. The confrontation marked the first time the United States has downed a pro-government aircraft since the Syrian civil war began in 2011. The Russian Defense Ministry called the attack an act of "military aggression" and pledged to halt cooperation with U.S. forces in response. "All flying objects, including planes and drones of the international coalition, detected west of the Euphrates, will be followed by Russian air defense systems as targets," the Russian Defense Ministry said in a statement. Dunford said American troops "made every effort" to warn the pro-Bashar al-Assad aircraft not to come any closer to the local Syrian Democratic Force. "The commander made a judgment that there was a threat to the forces that we were supporting and took action," Dunford said. "The only actions that we have taken against pro-regime forces in Syria—and there have been two specific incidents—have been in self defense and we've communicated that clearly." The Pentagon said it would continue operations against the Islamic State in Syria. "We are aware of the Russian statements," Navy Capt. Jeff Davis, a Pentagon spokesman, said in a statement. "We do not seek conflict with any party in Syria other than ISIS, but we will not hesitate to defend ourselves or our partners if threatened." This entry was posted in National Security and tagged ISIS, Joseph Dunford, Military, Russia, Syria. Bookmark the permalink.